What could be easier than cooking some meat in a pot? In my opinion, this is one of the easiest ways to cook it, and it’s difficult to spoil the meat this way. 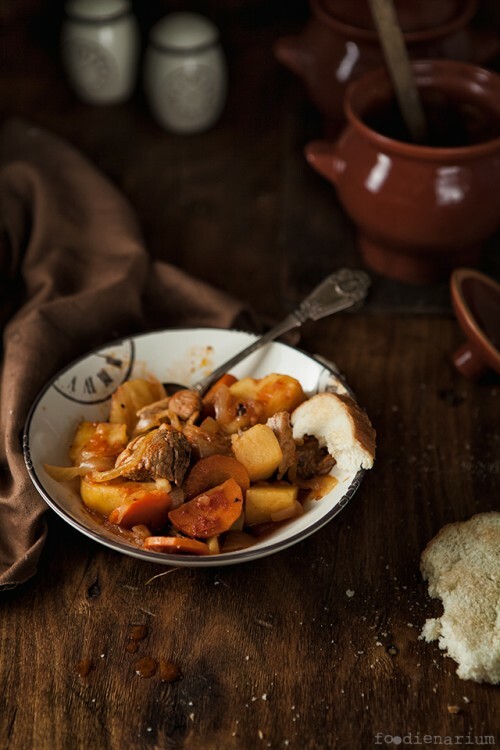 In addition, you can put some more tasty things in one pot with the meat and get well balanced food, which does not require a separate garnish. First cut the meat into 1 1/2 inch cubes and the onion into half-rings. Also chop the garlic and the potatoes into cubes. Cut the carrots into circles. Fry the meat on a preheated frying pan until it gets golden brown. It is better to fry over high heat, and in small portions, so that the meat doesn’t leave any juice. After frying the meat, fry carrots and onions in the same pan with for 5-7 minutes, until they get soft. Add a little salt and pepper during cooking. Put the ingredients into ceramic pots (you can use cast iron ones too). Put the meat on the bottom, salt and pepper it. Next, put the potatoes, sprinkle with garlic, salt and pepper, too. Further add onions and carrots. Fill with water or broth. If you cook with tomato paste, then dissolve it in the water or broth. Put the pots in the oven preheated up to 180 degrees. Cook for a two hours. After taking out the pots, you can leave them for 10-15 minutes. While serving, you can sprinkle the food with fresh herbs, or if you like, with finely chopped garlic.